Products which are not in the compulsory certification catalogue and cannot receive a CCC Certificate (China Compulsory Certificate) have the option to apply for a voluntary product certification. This CQC Mark Certification is a voluntary product certification. It is conducted by the official certification authority CQC (China Quality Certification Center). The CQC is sanctioned by the governmental agency CCIC (China Certification & Inspection Group) to manage the mandated process for manufacturers to get their CCC certification. The CQC is the largest professional certification body in the People’s Republic of China. The CQC offers a special voluntary CQC Mark Certification for a wide range of over 500 products that do not fall into the compulsory certification catalogue. The CQC Mark demonstrates the conformity of the product with the Chinese standards in regards to quality, safety, environmental and energy efficiencies. The CQC Mark Certification improves the perceived product quality within the Chinese market, giving a competitive advantage over products that are not CQC certified, facilitating the access of foreign products. National quality certifications like the CQC certification receive a better reputation in China in comparison to the UL, CE or ECE markings. For many product groups the CQC Mark Certification has set the standard by which product selections are made by the Chinese consumers. Another advantage is that products marked with the voluntary CQC Mark Certification have a greatly reduced risk of being detained by Chinese customs. The official CCC product catalogue is constantly extending its product range. Products that did not need CCC previously could be added and be required to have CCC without advance notice. Products that have the voluntary CQC Mark Certification can be more easily converted into a CCC certificate if it becomes required. The shortened certification process will give the manufacturer an advantage over his competitors, who may struggle with the new CCC certification process for their products. The voluntary CQC Mark Certification process is similar to the CCC certification process After the acceptance of application by the CQC, the Chinese authority will request test samples. The test samples will be tested in approved Chinese test laboratories according to the official Chinese GB standards. After the testing in China, a factory inspection at the manufacturing facility will be required. If the lab tests and facility inspections pass, the CQC will issue the CQC Mark Certification for the product and the applicant can apply for a marking permission for their product. 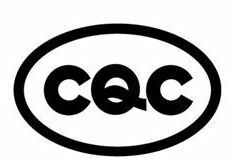 The CQC logo is required to meet certain requirements (size, color, etc.) which must be adjusted according the regulations. Wrongly marked components can cause trouble clearing Chinese customs. The CQC certificate and subsequent permission of printing are required to be renewed annually as part of a follow-up certification, which includes a factory inspection. The factory inspection is always conducted by auditors from the CQC, other authorities are not authorized to conduct the factory audit. We make sure that you will spend minimum efforts in order to pass through a quick and smooth CQC Mark Certification process. If you have any questions regarding CQC Mark Certification, you can contact us any time. Call us directly (UK: +44 2071931135, Rest of Europe: +49-69-2713769150, US: +1 773 654-2673) or send us an email.